Uniquely located in the northwest corner of Washington at the Canadian Border, Vancouver, B.C., lies 35 miles to the north, while Seattle is 110 miles south. Blaine, the Peace Arch City, is situated on the banks of Drayton Harbor and the foothills of the Cascade Mountain Range are 25 miles east with easy access to the Mt. Baker wilderness and Mt. Baker Ski Area. Blaine Real Estate offers a mix of housing opportunities ranging from low income to quaint nineteenth century homes to luxury waterfront homes near the 4 star rated Semiahmoo Resort & Spa. The average Blaine home price is $240,000 which is a more affordable alternative to Bellingham Real Estate. The harbor reflects the diversity of the town with a mix of watercraft ranging from workboats to yachts. East Blaine features rural residential with mostly 5 acres or more homes and mini farms. South Blaine includes the family resort community of Birch Bay. The population of the entire Blaine area is approximately 11,000, including 4,115 within the city limits. For a larger city experience try searching for Seattle Real Estate. Building lots in Semiahmoo's Carnoustie neighborhood. 10 forested acres ready for your secluded dream home. 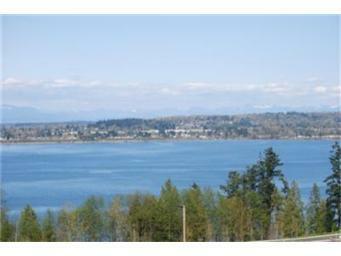 Buildable .185 acre waterfront lot.